Cayman Islands: A snorkel paradise. With hockey. When the day is done. 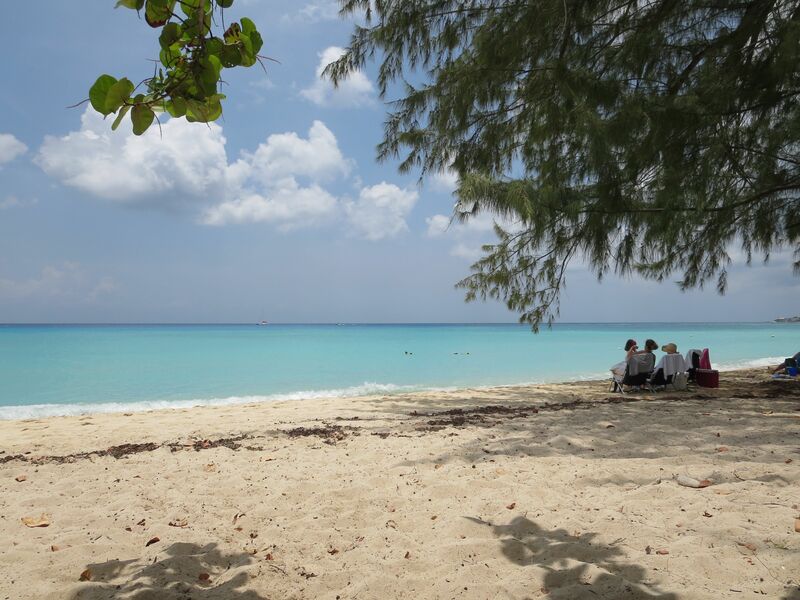 Why we love the Caymans. Even a writer can take a nice picture. GEORGE TOWN, Cayman Islands—The first time I thought about the Cayman Islands, I was a graduate student in journalism at Northwestern, taking a reporting class that required me to hang out at the federal courthouse. A celebrated trial was going on involving a Purolator armored-car heist where the cash had been linked to a Cayman bank. Purolator. The word still makes me smile. Who are you trusting your money to? Purolator? Or Brinks? Smith Cove is a popular spot for snorkeling and wedding vows. The second time I thought about the Cayman Islands, my friend’s parents had gone there for exotic Scuba diving. From my very limited knowledge base, the Caymans appeared to be a Caribbean Switzerland—a little too snobby and expensive, with a water sport that was a little too complicated, for my simple tastes. Then again, I had reservations about Northwestern till I got there, too. Tastes change, though—especially with the aid of knowledge. Having been to the Caymans half a dozen times, I can tell you that yes, there are a lot of banks and Scuba divers there, if you’re into those things. If you’re not, no worries. 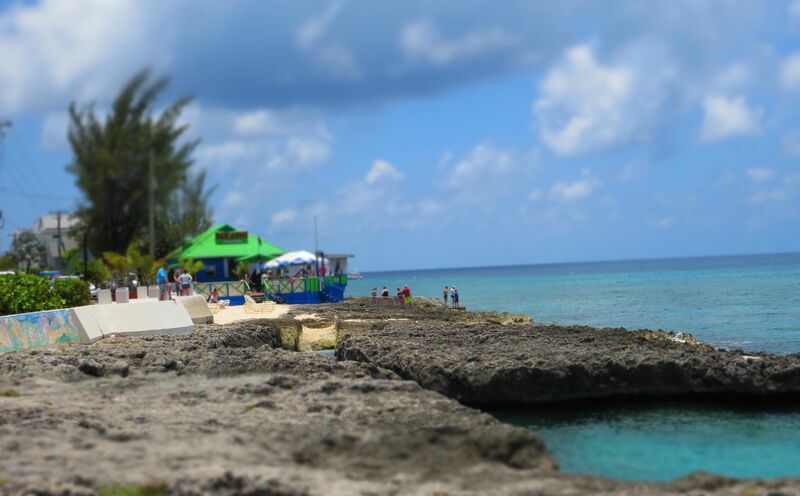 Grand Cayman, the largest of the three Cayman Islands, is simply a great place to snorkel and unwind. 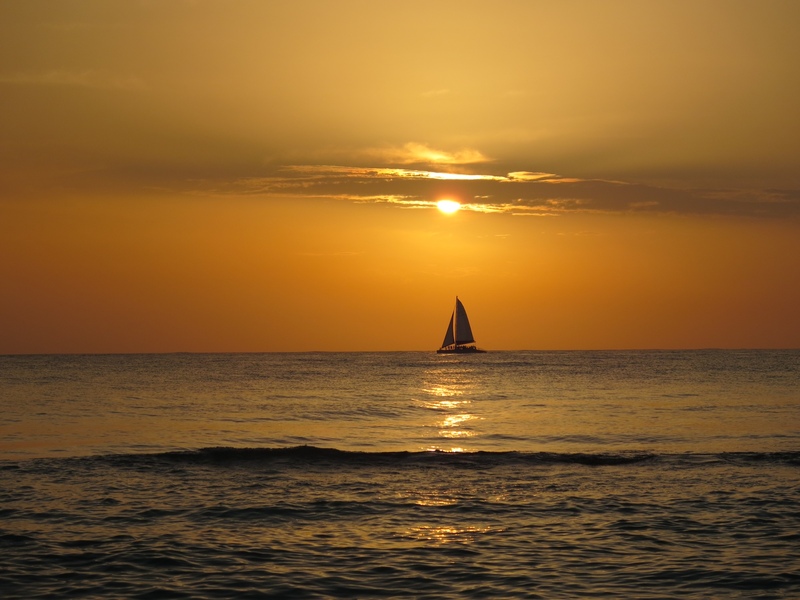 Seven Mile Beach goes on and on, and is home to some gorgeous unobstructed sunsets. Far from being snobby, Grand Cayman reminds me more of Canada’s southern-most maritime province. The money looks Canadian. And the island, which is still a British protectorate, attracts a large number of young Canadians, Australians, Brits and others from the Commonwealth who work and play there. Coconut Joe’s: Big screens outdoors for playoff hockey amid breezy palm trees. Little-known fact: Grand Cayman is one of the world’s best places to watch hockey. Thanks to its Canadian connection, the NHL playoffs are a big deal at the abundant sports bars. Many have large screens—some of them drive-in-movie sized—showing the chase for Lord Stanley’s Cup. And for some reason, we always seem to be there at the start of the playoffs. 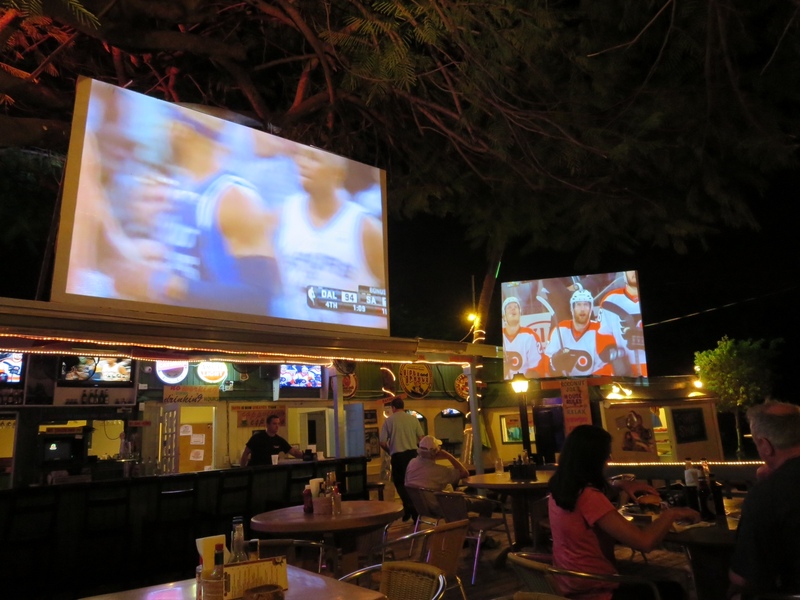 Our favorite is Coconut Joe’s, which has two wonderful and huge outdoor projection TVs. One screen, which is quite rectangular enough, chops off the score of one of the teams. The other screen, which is basically square, chops off the scores of both teams. And forget about how much time is left. I love it. At Coconut Joe’s, the key is great ribs, cold Caybrew (the local beer) and big screens swaying amid the palm trees. It’s the bar that time and score forgot. For a tiny island nation 150 miles south of Cuba, it’s hard to believe there are so many people who care deeply about hockey. But there’s no better place to watch hockey than Coconut Joe’s, which has a screen so big you have to peer around the palm trees. Paradise Grill: It’s a great place to snorkel from: Easy water access, turtle soup and yes, a tiny little patch of sand. It’s not all about the hockey, though. In a tropical paradise like the Cayman Islands, diving and snorkeling rule. It’s not always smooth sailing. Or even smooth snorkeling. But that can prove to be a bonus. On our last trip to Grand Cayman, for example, the sea was angry on the tourist-laden west side of the island. That meant some of our favorite snorkel spots were not options. Smith Cove, home to sunset weddings and enchanting shallow-water snorkeling? Too choppy. Eden Rock, home to amazing deep-water snorkeling in the shadow of the cruise ships that invade George Town? No go. Even the cruise ships weren’t dropping anchor in their usual spots. On Seven-Mile Beach, where we were staying, the man-made reef at the nearby Marriott was not an option. The water was so surly that even the fish had fled from the surfer-like waves crashing onto the shore. To my wife, who regards snorkeling the way Woody Hayes and Vince Lombardi looked at training camp—as a two-a-day activity—other diversions worked for only so long. Cemetery Beach is pristine and peaceful. There, we found a rough-weather suggestion. Try snorkeling at Connolly’s Cove, also known as Queen’s Monument, on the north end of the island. A 40-minute drive later, we pulled up to an obscure park. Two or three cars were parked there, and eight or 10 people were on the quiet beach. My wife was already putting the anti-fog goo on the masks, but I, Mr. Caution, didn’t see anybody in the water. “Let’s make sure about this,’’ I said, not quite ready to venture into a choppy sea on a remote beach until I knew more. That’s when we saw a man who seemed to be 80 years old gingerly backing into the water in fins and snorkel gear with the aid of a granddaughter. Or great-granddaughter. Following his example, we gently waded backwards into the shallow water for 10 or 20 yards, until it was deep enough to snorkel. And just as Testudo promised, there was a delightful, dazzling colony of fish, swimming through a habitat that looked like an underwater version of Arizona Highways. Just like that, we had another snorkel spot worthy of being mentioned alongside Eden Rock, Smith Cove and myriad sites along Seven-Mile Beach. We probably never would have found it not for stormy weather. No wonder those Purolator robbers found the Caymans the perfect escape. No question, the Cayman Islands are famous for diving. But if you prefer to keep your underwater experience simple, there’s nothing like strapping on a snorkel mask and some fins, and just diving in. No tanks, no certifying. No muss, no fuss. You can just do it. And while Grand Cayman, the largest and most accessible of the three Cayman Islands, is known for diving, it’s also great for snorkeling. One of the lures is that there’s great snorkeling right along the Grand Cayman shore, so there’s no need for boat trips and schedules. You can stay as long as you want, hop out for a snack or some sunbathing, and then go right back in. 1. Smith Cove: It used to be such an unassuming little park that we drove past it twice before we figured out where it was. But improvements have been made, including a parking lot across the street, that it’s not difficult to find now. Smith Cove is a great place to start because it’s very shallow and inviting for novices, and yet it has a beautiful coral reef area that’s teeming with fish, and is an excellent place to observe their habits as well as their colors. It also has rustic restrooms. But bring your own picnic food and drink, because Smith Cove really is a quiet spot˜except when the roosters that roam wild are crowing. About a mile south of downtown George Town. 2. Eden Rock: The Paradise Grill, at the south end of downtown George Town, isn’t simply a great place for turtle soup. It has a short ladder that drops into a breath-taking snorkel site. In the shadow of giant cruise ships and the rest of George Town harbor, Eden Rock is a cathedral-like experience because the reef ends abruptly, dropping off to a deep, sandy bottom. The adjacent Devil’s Grotto makes for a majestic snorkeling experience. Don’t fret about the huge tarpon that linger at the bottom of the ladder. While intimidating, they are very docile, and are apparently just waiting for a handout that’s apparently provided by the grill staff. 3. 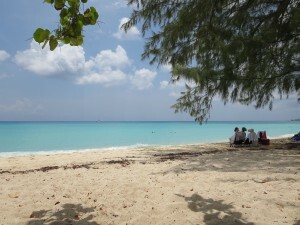 Seven Mile Beach–the Marriott Hotel and beyond: This is another shallow snorkel spot that’s novice friendly. Just wade in at the Marriott and enjoy the fish attracted to man-made cones that serve as a reef-like fish magnet. If you’re adventurous, swim out to the reef off of the nearby Treasure Island condos. Just look for the buoy that’s straight out from the large-rock cove. 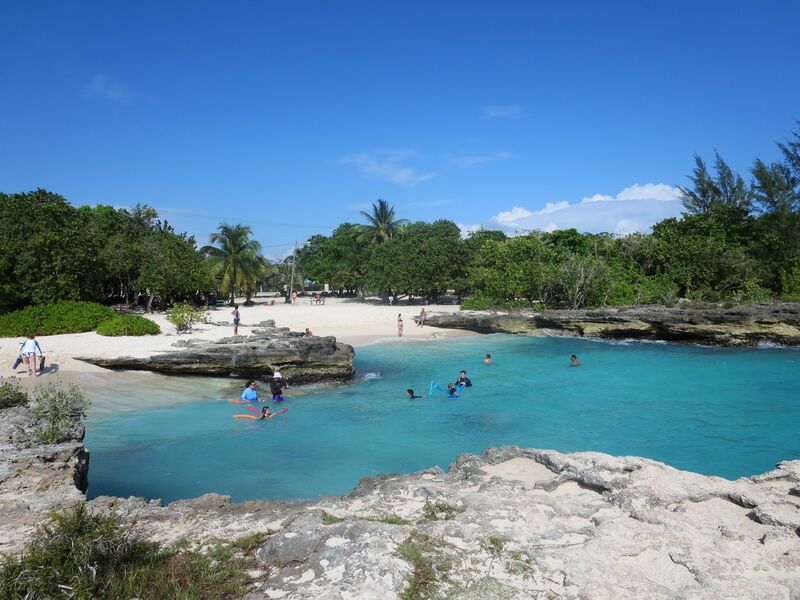 It is a bit of a swim, but the coral and the fish are worth the workout. 4. Cemetery Reef: On the northern end of Seven Mile Beach, Cemetery Beach is a peaceful spot that has an excellent reef about 100 yards from shore. No facilities here, so pack for a day at the beach. Just look for the cemetery by the side of West Bay Road and follow the “beach access’’ sign along the northern edge.